Step 1: We diamond grind your conrete to achieve a proper surface profile for maximum adhesion of the epoxy. All of our diamond grinding machines have HEPA vacumms attached to maintain a clean and virtually dustless environment. Step 2 (if necessary) We fix any cracks or pitting that may exist using our polymer modified oncrete or epoxy patch. Step 4: We broadcast the decorative flake with your color of your choice. Step 5: Apply a final topcoat of Polyaspartic or Aliphatic Epoxy. (Aluminum Oxide can be broadcast at this point to create a non-slip, textured floor). 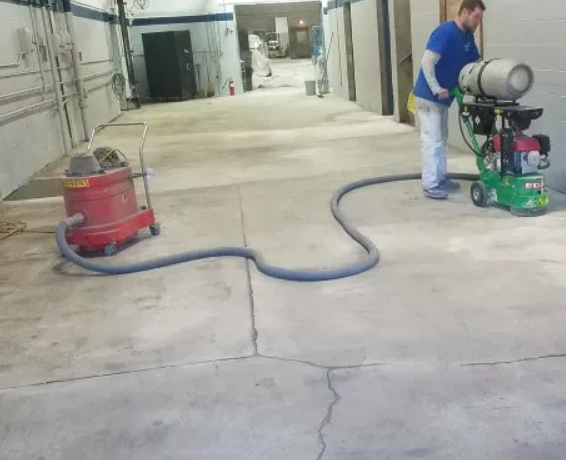 Preparation is essential for a successful Epoxy Floor Application. We grind and prepare the surface before applying basecoat/sealant. Typical installation time is approximately 1-2 days, but in most cases it is the SAME DAY.